On Tuesday, one year before the 2016 presidential election, thousands of fast food workers walked out of their jobs in 270 cities. Organizers say it is the largest action yet by the three-year old Fight for $15 movement. An even larger number of workers from other low-paying jobs joined them in marches on local city halls in a total of 500 cities to send a message to political candidates: they represent 42 percent of the American workforce, and if they register to vote and go to the polls, they could make a huge difference in next year’s elections. Their challenge to politicians was simple: “Come get my vote.” If candidates want this bloc of voters, they will have to support a minimum wage of $15 an hour, protect the right to organize a union, provide affordable child care and high-quality long-term care, reform immigration laws and address racism towards African-Americans. The movement, in turn, will face the challenge of demonstrating that it can deliver that low-income bloc of Americans, including many black and Latino voters, who historically do not register or vote with anything approaching the reliability of higher-income voters. Polling undertaken on behalf of the National Employment Law Project (NELP), a research and advocacy group focused on low-income workers, suggested that candidates who promote the Fight for $15 agenda would inspire and attract such voters, but it would likely require massive, targeted organizing to make that happen. Although some workers expressed a desire for the movement to endorse candidates who meet their standards, conversations with organizers suggested that such a move is unlikely. 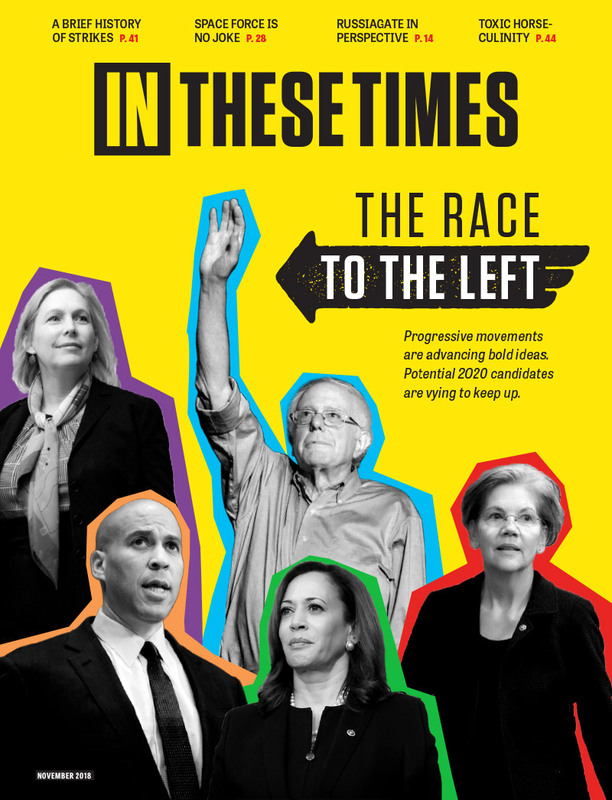 But informally the message will get through about who is favored, as the relatively frequent favorable references to Hillary Clinton (and fewer nods to Bernie Sanders) in the publicity materials for the day exemplified. The Fight for $15 demonstration in Milwaukee succeeded in making the minimum wage the first question in the Republican presidential debate in the evening. Republicans, in particular Donald Trump, Ben Carson and Marco Rubio, made it clear that they opposed not only a hike in the minimum wage to $15 but even any smaller increase. Their argument: any increase would reduce employment and make the U.S. non-competitive in the global economy. If Republicans keep coming at low-wage workers with such arguments, they are likely to help Democrats gain votes. The conditions that low-wage workers face are also worsening, further motivating support for the goals of Fight for $15. According to recent analysis from the Economic Policy Institute, a progressive think tank, the real, inflation-adjusted wages of most U.S. workers have declined since the end of the recession. Moreover, a new report from NELP concludes that “on average, the lowest-paying jobs have experienced disproportionately greater declines.” The median hourly wage declined by 4 percent from 2009 to 2014, but occupations in the bottom two quintiles, or fifths, of all occupations dropped 4.7 percent and 5.7 percent. The two occupations with the greatest drop during this period were cooks and food preparation workers (respectively falling 8.9 percent and 7.7 percent). Other occupations with significant drops include janitors, personal care aides, home health aides, and housekeeping cleaners. Even more troubling, the Bureau of Labor Statistics has forecast that the greatest growth in jobs between 2012 and 2022 will come among these occupations with wages falling an average of 5 percent or more from 2009 to 2014. The protests at city halls around the country symbolized not only this sharp turn by the Fight for $15 to politics but also the political successes with setting a $15 an hour minimum at local government levels in many areas, such as SeaTac and Seattle, Washington; Los Angeles; and San Francisco; or for specific industries in Massachusetts (home care workers) and New York (fast food workers). Kelleher notes that many workers whom SEIU had previously organized in both the private and public sector earned less than $15 an hour, but the Fight for $15 has helped to strengthen their hand in bargaining and to push their wages up, even if many still earn less than $15 an hour. As more low-wage occupations join the fast food workers in demanding $15 an hour, other groups are inspired to become allies in the fight. One of the latest, organized largely by the United Students Against Sweatshops, are students working on college and university campuses, who are squeezed by growing tuition and debt. At the University of Washington, USAS recently won a minimum of $15 for all campus workers, including over 5,000 student workers, and the campaign is thriving in states such as New York, Colorado, Illinois, an dWisconsin, according to USAS. The political dimension of the Fight for $15 has expanded in other ways beyond expanding the base of demands for higher pay and a union in recent months: The movement is increasingly tackling issues of immigration reform and police practices in the black community. For example, after a morning rally at a South Side Chicago McDonald’s, a group of about 125 protestors, including both fast-food strikers and other low-wage workers from O’Hare Airport, home care, day care and other businesses, as well as from the city’s Coalition for the Homeless, marched a few blocks to the Chicago police headquarters. A better way of life. That sounds ambitious. But then again, so did $15 an hour.